Haven’t decided on a hotel yet? You can look at other available hotels in the Castilla La Mancha region with Booking.com. With a name like Castilla you know that castles are never far away. From the 9th through the 12th centuries, this region was a battleground between the Christians and the Moors, with castles often changing owners between the two. Other castles were built in frontier areas, such as between Aragón and Castilla. 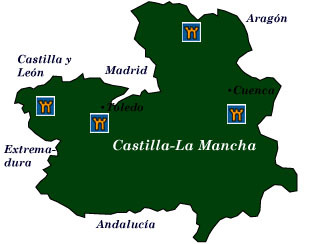 Sometimes Castilla-La Mancha is referred to as “New Castile,” in contrast to “Old Castile,” which is the present-day region of Castilla y León. The name “New” comes from its recapture from the Moors sometime later. La Mancha, on the other hand, translates as “arid land” in Arabic. Ironically, on the vast, barren stretches of the central plateau—the meseta—you’ll find some of Spain’s most popular attractions. Toledo Situated on a rocky hilltop visible from miles away, Toledo is one of Spain’s most popular cities, some would say the highlight of their trip. The Visigothic capital of Spain in 554, it prospered for centuries under Moorish rule, when Muslims, Jews, and Christians worked side by side. Their artistic legacy is evident at every turn. Steep, twisting cobbled streets lead past grand monuments of Spanish history. Toledo’s famous cathedral, built on the site of a Visigothic cathedral and a mosque, is now one of the largest cathedrals in the world. The Iglesia de Santo Tomé houses the El Greco masterpiece, The Burial of the Count of Orgaz. Downhill, the Casa de El Greco displays a fine collection of his paintings. Toledo’s oldest church, the Iglesia de San Román, has Visigothic origins and now serves as a museum. The Mezquita del Cristo de la Luz is the city’s only remaining Muslim structure, dating from 999. One of Toledo’s most identifiable monuments is the Alcázar, a once mighty fortress built on a Roman structure that now houses a military museum. Cuenca Spectacularly perched on a cliff between the Huécar and Júcar Rivers, Cuenca is known for its Casas Colgadas, or “hanging houses.” Contemporary artists have been drawn to Cuenca, with an art museum, the Museo de Arte Abstracto, housed inside one of these famous hanging houses. The town is a delight to explore. A highlight is the 12th- 16th-century cathedral, a combination of Gothic and Renaissance design. Windmills of La Mancha Those giants that Cervantes’s Don Quixote took to task are spread across a few areas of La Mancha. The best places to see them are in Consuegra and Campo de Criptana. A few still have their original machinery. For those who further wish to visit ties to Don Quixote, the village of El Toboso—the legendary birthplace of Quixote’s lady love, Dulcinea—has been restored to a 16th-century style. Castles Castilla-La Mancha has superb castles to explore. Among the best ones are Alarcón and Sigüenza, which are now beautiful hotels, the well preserved Belmonte, which dates back to the 15th century, the 11th-century Molina de Aragón, with its six original towers, and Calatrava la Nueva, founded in 1217 by the Knights of Calatrava.